Sackler Gallery and Arts in Embassies Presented Artist Cai Guo-Qiang’s “Explosion Event” Nov. 30, 2012 Chinese-born artist Cai Guo-Qiang staged one of his remarkable “explosion events,” a thrilling combination of pyrotechnics, artistry and optical illusion in four dimensions Friday, Nov. 30, 2012. The event was presented by the Smithsonian’s Arthur M. Sackler Gallery and Art in Embassies, an office of the U.S. Department of State, and is in celebration of the Sackler’s 25th and Art in Embassies’ 50th anniversaries. 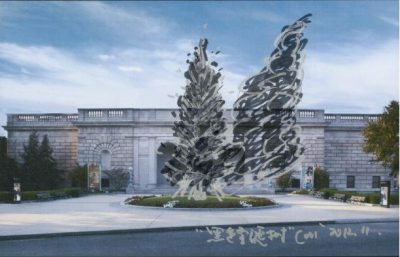 Shortly after 3 p.m. on the north side of the Freer Gallery of Art, a live 40-foot-tall pine tree erupted in an effervescent shimmer of fireworks as if in a “tree lighting” ceremony, followed by a cascade of black ink-like smoke that mimics the flowing beauty of traditional Chinese brush drawings. The black tree-shaped cloud of smoke drifting through the air created a spectral scene of two trees, one real and one ethereal. The site-specific staging is part of Cai’s larger series of “explosion projects,” which have been featured at the Museum of Contemporary Art in Los Angeles, the John F. Kennedy Center for the Performing Arts in Washington, D.C., and Central Park in New York City.